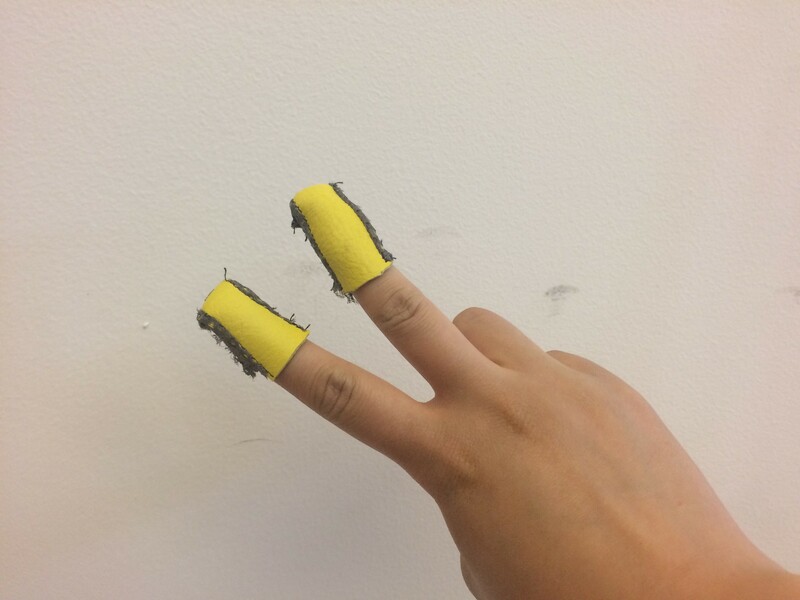 Hand Substrate Interface Prototyping Continued! This post marks part 3 (?) of the Hand Substrate Interface to be used to test for soil moisture. 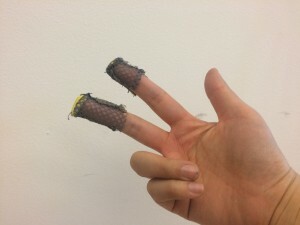 To use the Hand-Substrate Interface, the user interacts with the glove in order to obtain the reading. A reading is only taken when the user wants to measure the soil moisture level, as opposed to obtaining a constant feed regardless of the hand placement. This will conserve battery life while out on a foray along with making sure that the data collected is accurate of the substrate condition. 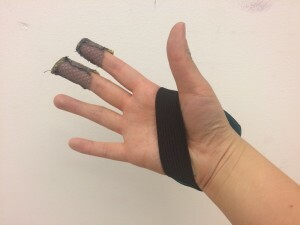 In order to understand this experience, the interaction between the glove and the user has been storyboarded to see this data collection process. The storyboard is as follows: The user is on a foray and moves through the woods when they spy a lone mushroom specimen growing on the forest floor. She kneels down next to the mushroom to get a closer look, making note of the surroundings, along with making initial identifications of the mushroom. The user then pushes a button on the HSI in order to let it know that she needs to take a reading. Seeing the interface respond, she then takes the soil moisture reading with her hand, taking note of the reading. From this reading, she sees that the ground in this area is much more moist than an earlier area of the walk. Looking around to get a idea of the level of the ground, the user wonders if this is because the ground is at a lower topographic height which would collect more water. She looks up to see the density of the foliage overhead and wonders if the increase in tree canopy has created a barrier for the soil moisture to evaporate, thus leading to an increase of mushrooms cropping up in the area. 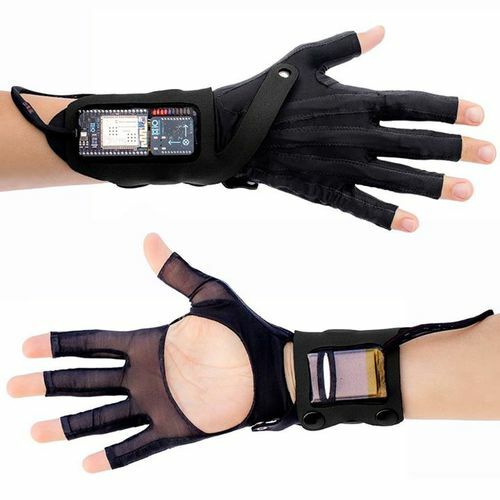 As the user ponders these environmental questions, this data captured from the reading which includes the moisture reading, GPS location and timestamp is then stored in the glove. After the walk, she will extract this data from the HSI and upload it to her local mycological club’s online database where she can compare walks this data to what other members have collected. 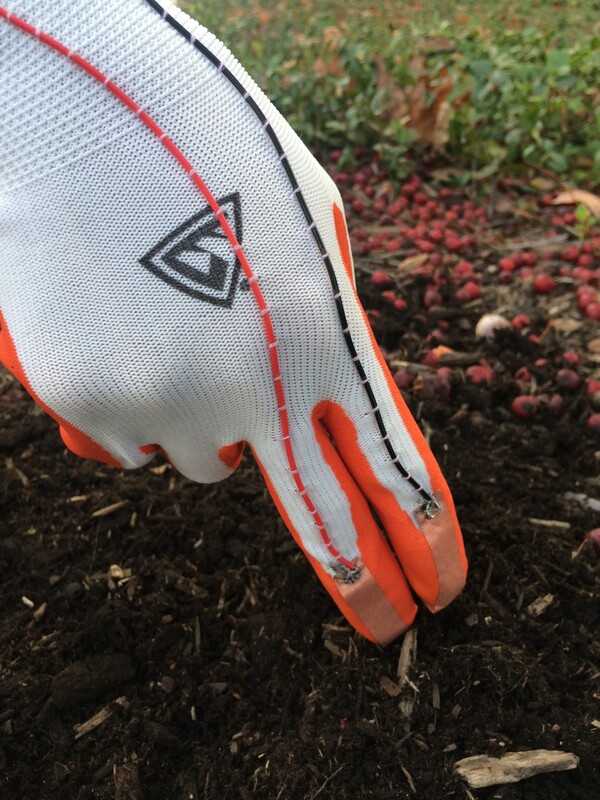 Since a reading is only taken when the user wants to get the soil moisture level as opposed to obtaining a constant feed, the interaction between the user and the glove needs to be designed in order for the user to obtain the reading as needed. An RGB LED interface is used on the glove in order to display the various states of the gloves to the user. A Neopixel 12 – LED ring is being utilized as this display because of its compact size and circular features. 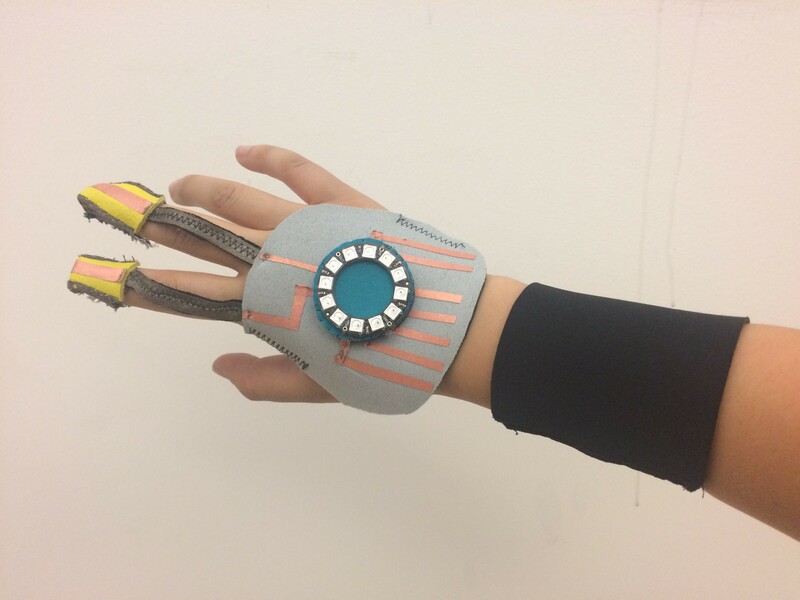 Less than 2 inches in diameter, the Neopixel is able to lie flat on the back of the hand or elsewhere on the arm. 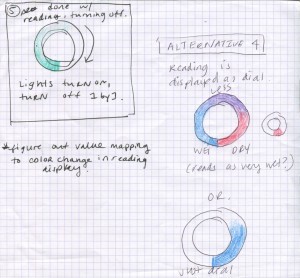 The circular nature of the LEDs also allows to function as a dial when getting a reading. This ring formation also gives way for placement of a momentary switch that the user can press to cycle through various states of the circuit to interact with the HSI. 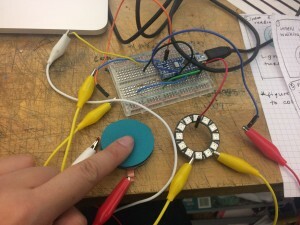 The use of RGB LEDs and programmability of the Neopixel ring gives flexibility in a range of designs and patterns that can be used to communicate these different states. 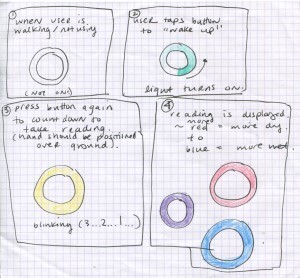 While the user is walking through the woods, the ring is turned off, with no LEDs on. 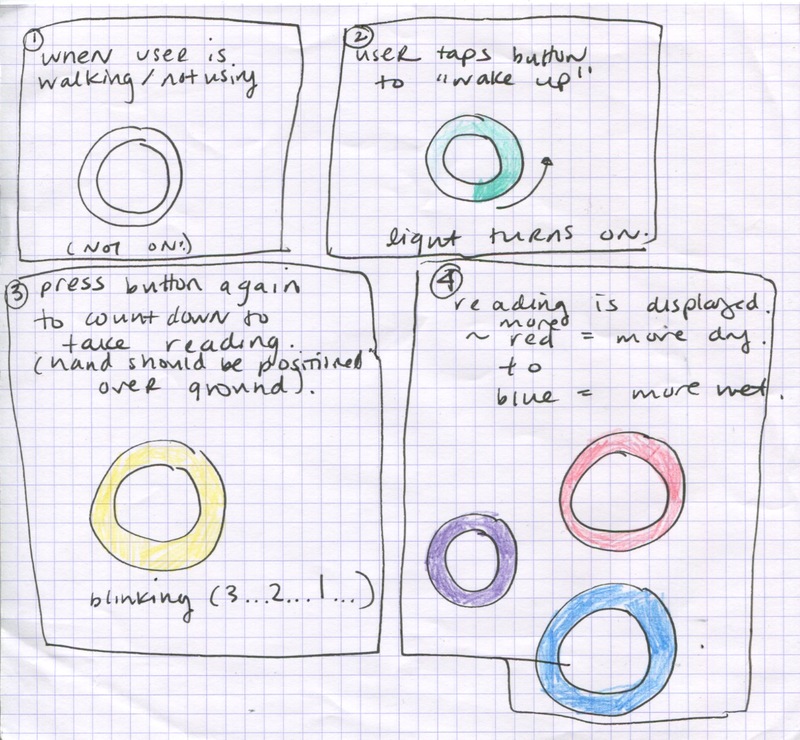 Only when the user needs to take a reading will she press the switch located at the center of the ring. Upon being touched, the ring will light up, indicating that it is now turned on. When the user is ready to take a reading, they will press the button again, whereupon a pulsing light with yellow LEDs blinking off in succession four at a time which will indicate the countdown for a reading. With the 12 LEDs on the ring, this will indicate a three second countdown. While this is happening, the user will have time to place their fingers in the soil to ready themselves for a reading. After the blinking countdown, the ring of lights will now function as dial, showing the moisture of the soil based on how many blue lights are turned on going in a counter clockwise direction starting from the bottom center of the ring. This reading may fluctuate if the user is moving while taking the reading, but when it senses that there is no change after a few seconds, the reading is then stored, shown by a blinking green light. The user may now take an additional reading if desired, or continue on their foray. If the HSI senses no activity after a short period of time, the system will go to a battery conservation mode, indicated with the lights powering off. 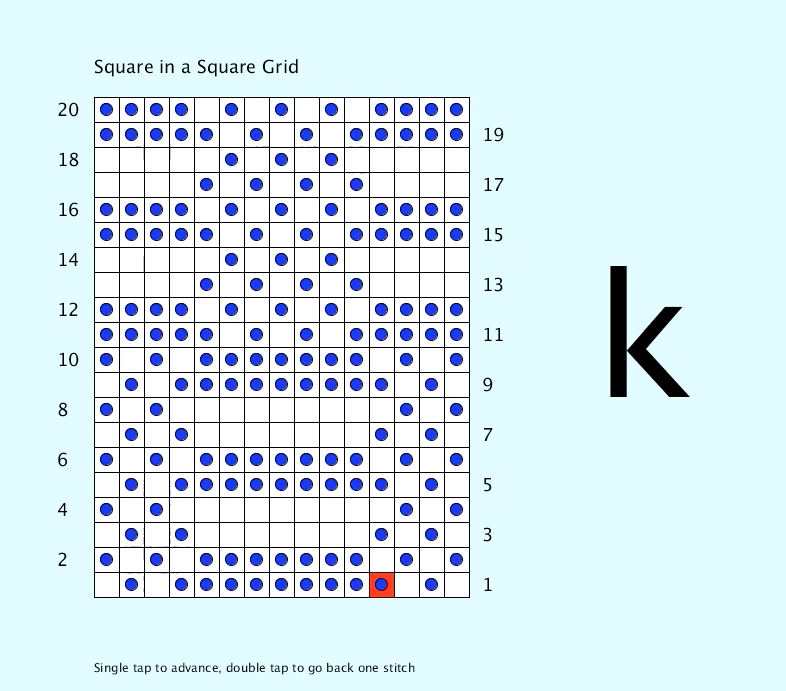 This interaction is simple in indicating to the user what state it is in order to allow for ease of use. Although the reading does not give the user a numerical value, the dial will give the user a visual sense of the reading, which can be compared with other readings taken during the foray. This design choice was made in order to keep the user focused on the process of the walk, rather than have to compare the actual numbers. Rather than presenting the data points as hard values, the dial indicator for the soil moisture reading acts as a suggestion and reminder for the user to question and compare the readings at other points of the walk. The data containing the actual numerical values however, can be stored and analyzed at a later time. Through use, the user may also develop a different sense of reading and using the HSI as she gains experience with the interaction of getting a reading through her fingers. 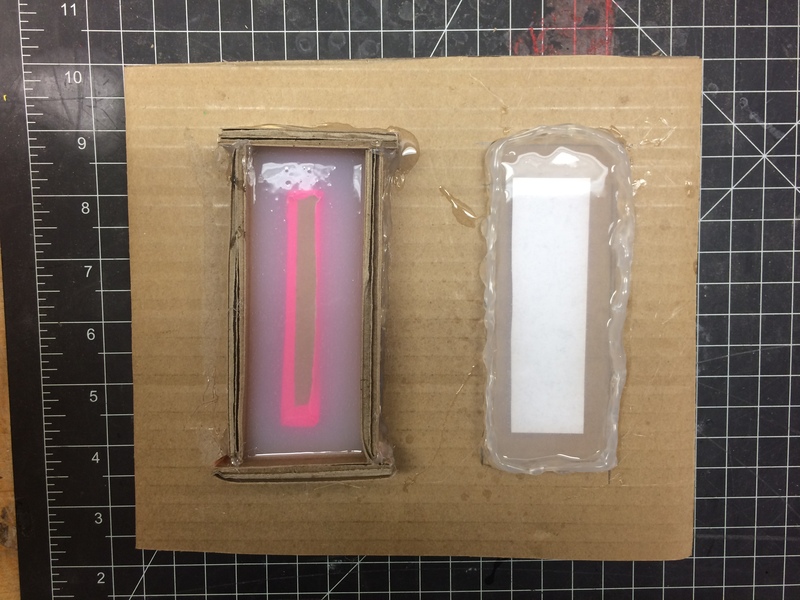 In prototyping this interaction, a soft momentary switch was built to use with the Neopixel ring. 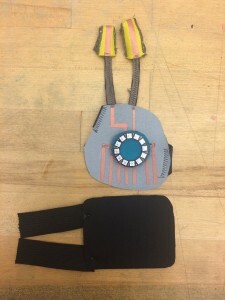 The momentary switch is made using two pieces of neoprene with copper conductive fabric adhered on one side using fusible webbing. The button is designed to be the same size as the Neopixel ring so that the ring can sit ontop of the button in the glove design. 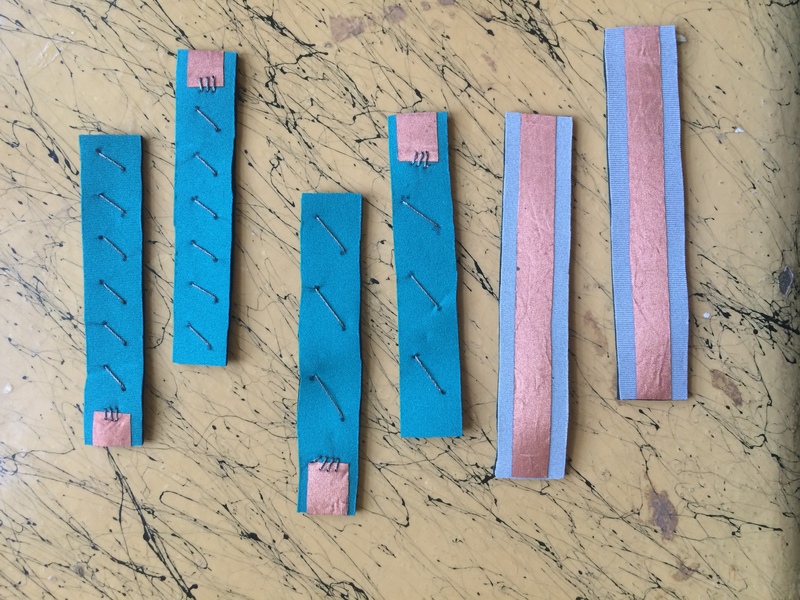 On one of the neoprene pieces, another piece of neoprene cut in a ring is attached on top of the copper fabric to prevent the two copper fabric pieces from constantly touching. The neoprene pieces are then hand sewn together to form the button. 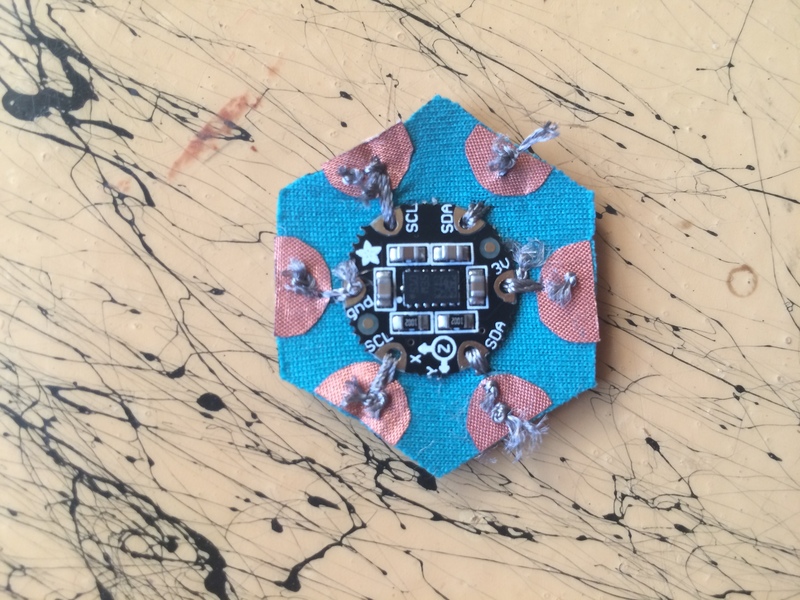 Only when the button is pressed down upon, will the two conductive fabric pieces make contact and read as a button press. A pull up resistor is added the switch so that the reading of the switch will constantly be read as “high” until button is pressed. 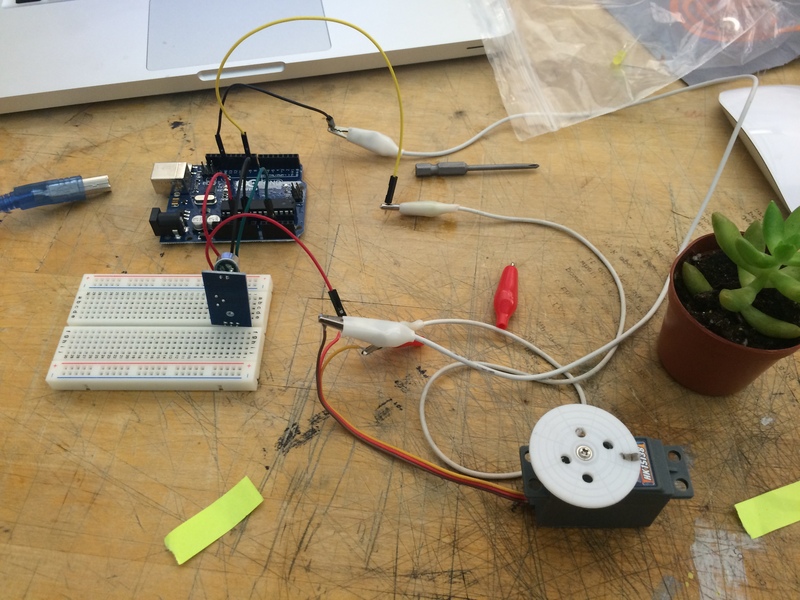 The code for the program was written in Arduino using parts of the Neopixel library and combined with a previously written program for a soil moisture sensor that was adapted from the GardenBot project. 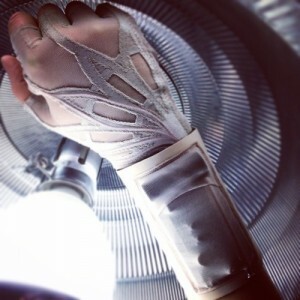 In considering other materials that can be used to build the gloves, leather was utilized in the third iteration of the glove design. Though it can be difficult to sew, leather can be more comfortable against the skin, provide structure for the form of the glove, along with being a durable material. Although leather is a material commonly used for making gloves, the nature of wearing another’s skin to enabling the wearer’s ability to sense the environment is also a bit fascinating. 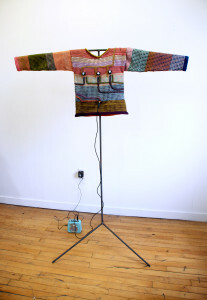 Given that this project overall advocates for facilitating new relationships between humans and other nonhuman agents, it is noted that only waste scrap leather was used from this project that was obtained from a wholesale resale fabric store in the Fashion District in Los Angeles. In this iteration, the finger pieces are semi-detached from the hand in the glove. The leather is used to create a cap that sits on the fingertips where the exposed traces sit to take a reading. A mesh fabric harvested from a laundry bag was used for the underside of the finger cap so that as the sensors are placed in the soil, the user is also able to feel the ground through the mesh fabric. To attach to the rest of the glove, traces are made out of conductive spandex zig-zagged stitch to a cotton jersey material to create connections from the finger caps. 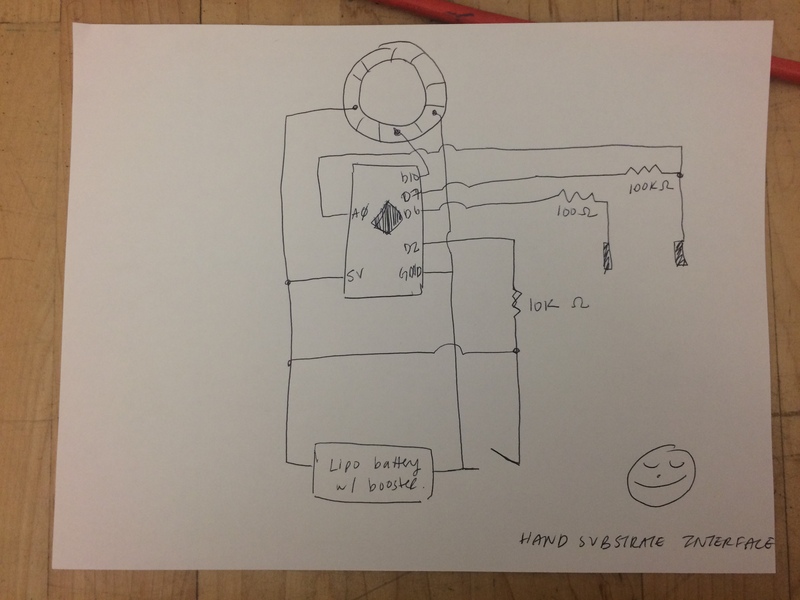 On the back of the hand, a circuit is laid out to for the soil moisture sensor, Neopixel ring and the momentary switch. 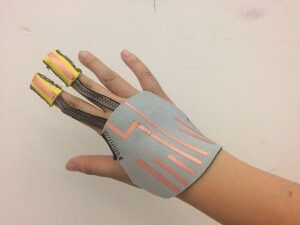 The glove will then be attached to a wristband that will house the microcontroller, battery and other electronic components to form the circuit. 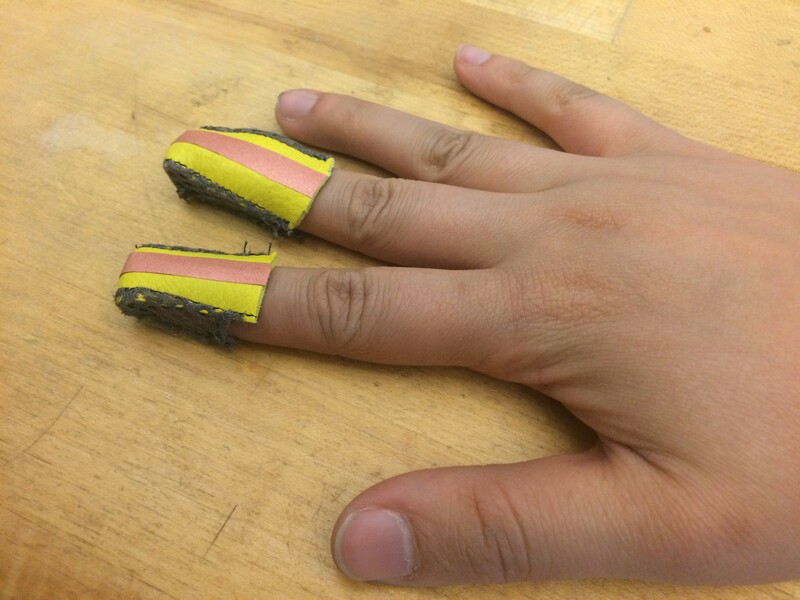 Spreading the circuit out along the hand onto the arm prevents any bulky areas from forming that might get in the way of wearability. Splitting the circuit into different sections would also allow the circuit to be more accessible if there are any errors. 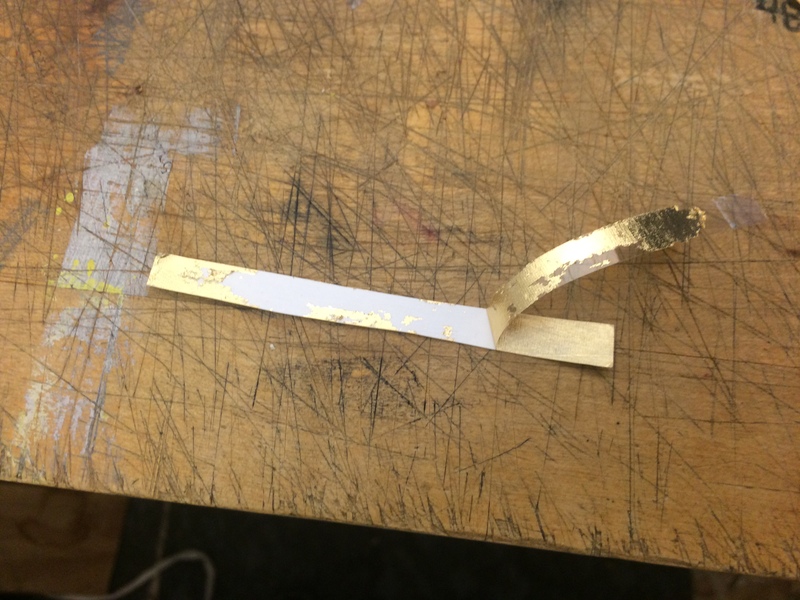 The creation of the wristband also provides a platform for the addition of other components and features in future iterations. 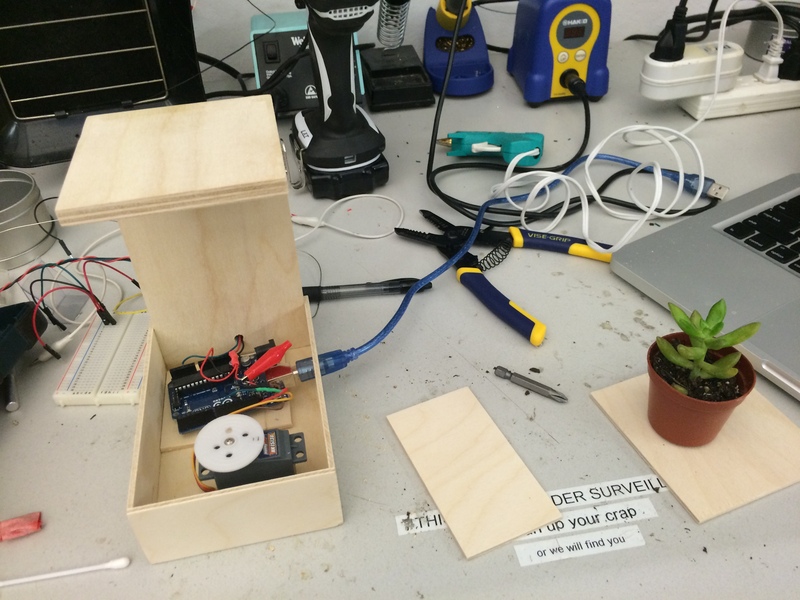 For example, the current demo prototype does not include the GPS module or a soil temperature sensor. 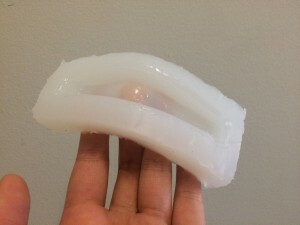 However, the wristband would allow for placement of more components that could be added to the Hand-Substrate Interface. 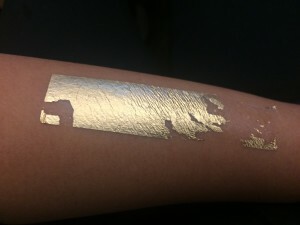 Posted on April 22, 2017 Categories Coding, Fabrication, Physical Computing, Research, Textiles, ThesisLeave a comment on Hand Substrate Interface Prototyping Continued! Since conceptualizing the shoe that takes in soil samples, I have taken steps to implement this idea into an object. In looking at precedent works, there are a wide range of projects that have embedded technology into footwear. A common thread throughout these projects is that the functionality of the shoe depends on the movement of the wearer in order to actuate it. 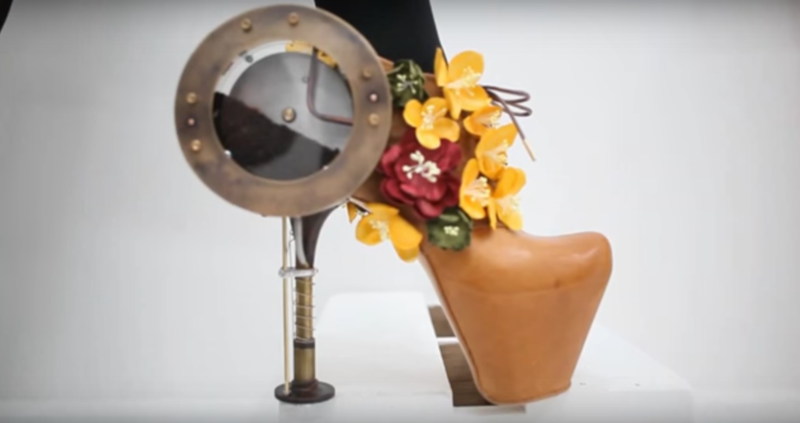 The Nanohana Heels is a project by artist Sputniko! 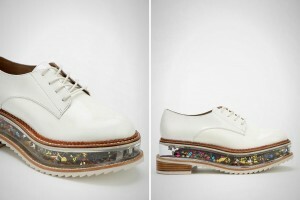 in collaboration with shoewear designer, Masaya Kushino. This pair of shoes was developed in 2012 following the Fukushima Daiichi nuclear disaster in Japan during Spring of 2011. As demoed in a video about the shoe, with each step into the earth, rapeseeds (nanohana in Japanese) are dispensed from the stiletto point of the heel. According to Sputniko’s website, Belarusian scientists have determined that rapeseed blossoms are able to absorb radioactive substances. This research was done on lands affected by Chernobyl in the 2000’s to consider remediation of lands. By planting rapeseeds with each step, the shoes seek to question how to heal the land damaged by the nuclear disaster through action. For the soil sampling shoe, an opposite effect is desired, in which matter is collected rather than dispensed. Also instead of each step leading to soil collection, the action will have to be spaced out through out the duration of the walk, otherwise a lot of soil would be collected. Based on prior research on soil sampling, 40 mL of soil is suggested for a sample. This sample would then need to be located near the foot, whether directly in the shoe, or perhaps near the foot around the ankle. E-Traces by designer Lesia Trubat documents the movement of dancers through sensors placed on the ballet shoe. 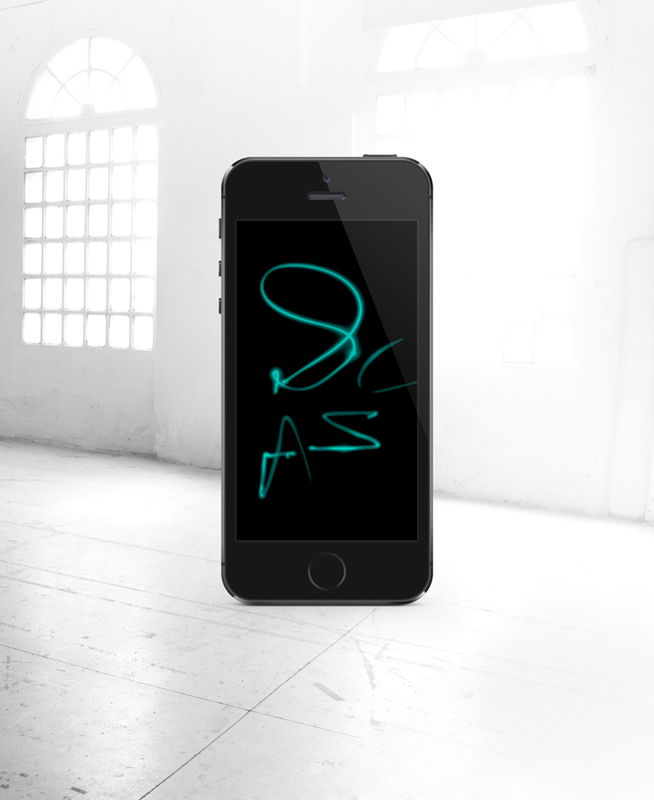 This movement is then sent via wi-fi to a smart phone which then presents the traces performed by the dancer. This project seeks to create a digital artifact of the performance to function as a visual image to allow the dancer to study their movements in order to learn and improve from this tracking. In considering the tracking function of E-Trace, this could provide an understanding for development of a tracking function for the soil sampling shoe. This would allow the shoe to determine when to collect soil, based on where on it’s position of a space, such as a park or trail. Roller shoes are a type of footwear with an embedded wheel, allowing the wearer to glide across a surface when the weight is shifted onto the heel. Roger Adams, the founder of roller shoe company Heelys, patented this design in 1999 and has geared it towards the youth market ever since. Based on the company website, he “cut open a pair of sneakers, inserted a skateboard wheel, and Heelys were born!”. 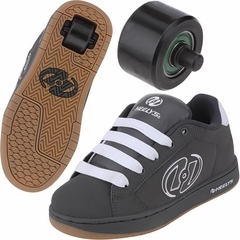 Current Heelys sneakers also feature a removable wheel which would allow the wearer to step without rolling. Although Heelys and other roller shoes are popular due to its recreational aspects by embedding a normal shoe with the potential for rollersport activity on any flat, hard surface, this has come not without controversy. From frustrated pedestrians and shopkeepers to concerned pediatricians, roller shoes is seen as a dangerously annoying and annoyingly dangerous footwear. However, even almost 17 years since this product come onto the market, several retailers still carry roller shoes in their inventory. As a precedent work for the soil sampling shoe, roller shoes serve to be an interesting design for how technologies are embedded into the shoe, particular in the heel which makes direct contact to the ground. The pressure on the heel activates the wheel in the roller shoe, allowing the wearer to glide or roll across their surface. This insight provides consideration into how the wearer must interact with the soil sample shoe in order to facilitate the collection process. Although the shoe provides a more passive soil collection compared to existing methods, certain actions or gestures must still be performed in considering the interaction design aspects of the object. The soil extracted from the ground for the soil samples collected by the shoe needs to be accessible for analysis, thus can follow the retractibility of the wheel in the roller shoe. 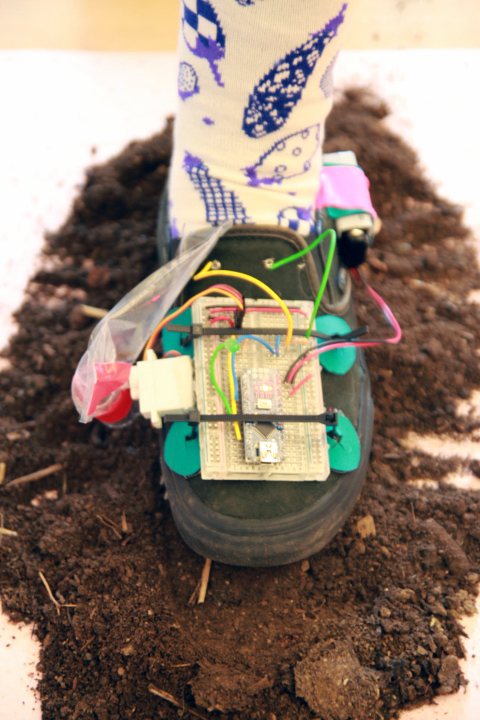 In the first iteration of the soil sample shoe (working title is “Spore Stepper”), a circuit was built onto an existing shoe to allow soil sampling to occur. 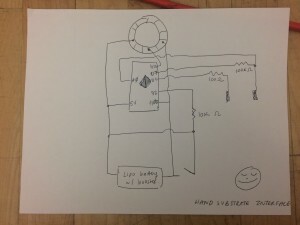 A circuit that controlled a servo motor was built that was controlled by a pressure sensor switch. 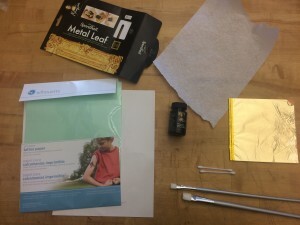 A scoop and collection bag are built on top of the servo motor so that when the pressure sensing switch is closed, the servo motor would pick up dirt using the scoop attachment and deposit the dirt into the bag located directly behind the scoop. 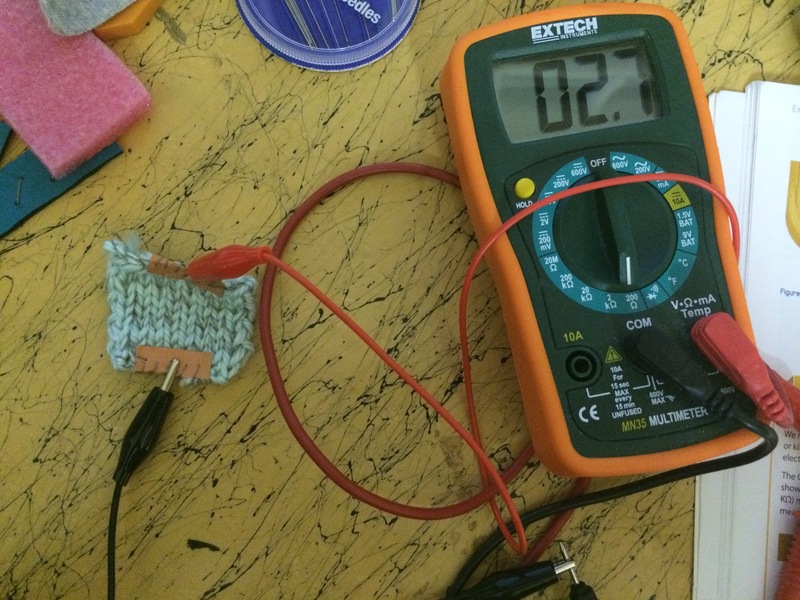 This circuit was then fastened to the a Vans Classic Slip on shoe by using zip ties to connect the breadboard where the microcontroller and some of the components are held to the flat part on top of the foot. The design of this shoe allowed for easy access to fasten the breadboard onto the surface. The switch was installed inside the shoe where the ball of the wearer’s foot would reside. 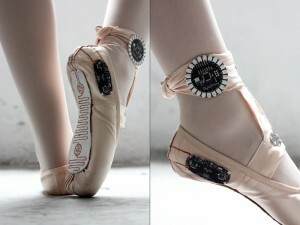 This would allow the switch to be activated when pressure was placed at the front of the shoe, such as when the user is mid-step. 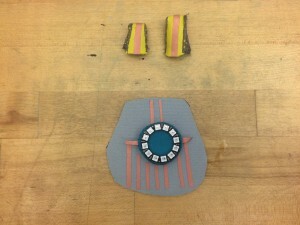 The servo motor is then placed on the inner side of the shoe, adhered to the shoe using hot glue. The scoop attachment is angled downwards, so that soil would automatically get pushed into the scoop when the scoop is made. As the wearer steps, the servo motor is triggered, which dumps the dirt collected onto the scoop into a collection bag located at the other end. 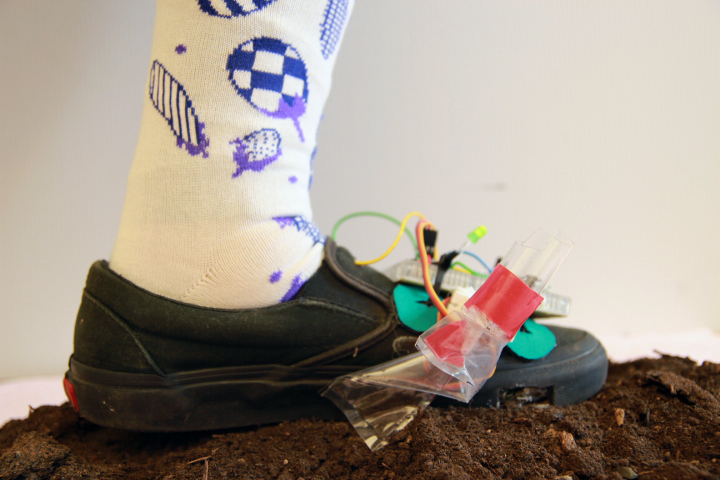 This low-fidelity prototype is an early proof of concept to show a possibility of how a soil collecting device can be attached to a shoe. 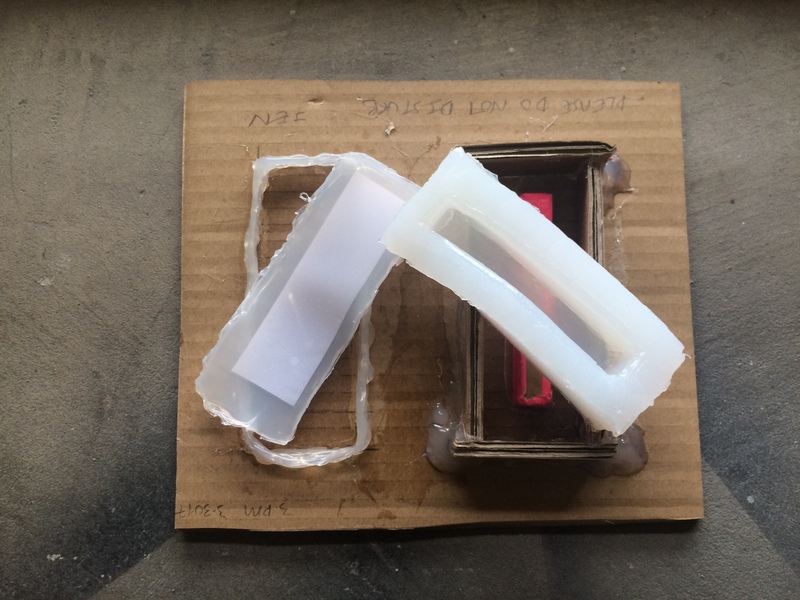 Although it is functional, several design and technical considerations can be made to refine this prototype. One major design consideration is how to fully integrate the components into the shoe rather than having the components sit on top of the shoe. This would entail building the electronics into the shoe in a more seamless manner. 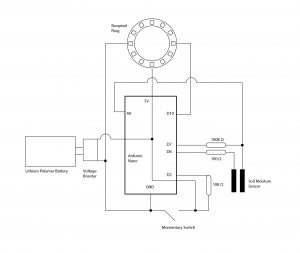 A technical consideration is to use another method of soil collection that would allow the soil to be collected more naturally with the step action of a user, rather than having a servo motor pick up the dirt. 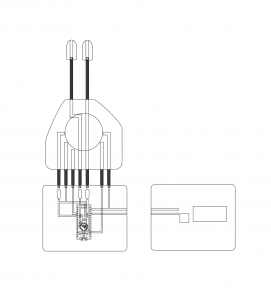 An addition of an inflation bulb such as the ones used for a turkey baster or blood pressure pump would allow for suction without digital components, though placing of this component in the shoe for proper inflation and deflation would be complicated without constant collection happening by the suction. Initial tests with a turkey baster also did not prove to be successful in collecting dirt. One method to reconsider the soil collection methods is to use soft robotics to move the soil into a collection chamber inside the shoe. The soft robotics would take form of a pneumatic muscle located in the outsole of the shoe that can expand and contract to push the soil into a collection chamber also located in the outsole. The natural pressure from taking a step would push dirt into the entrance of the muscle through the tread. Only when the shoe is ready to collect dirt, through tracking the distance in between the last time of collection or at discretion of the wearer, the muscle will activate to “swallow” dirt into collection. Although it would still need digital components such as a pump, microcontroller and power source, a soft actuator would be easier to implement into shoe rather than accounting for the full range of motion that is required by the servo motor. At this point in building the prototype, the actual artifact of the shoe was taken into consideration. As a speculative piece, it was important for the object of the shoe to present the potential functionality and conceptual elements of the piece, more so than to be a robust, efficient model (at least this is what I am telling myself). 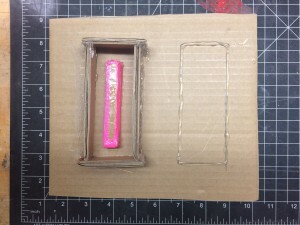 To test out this method, I followed instructions set forth by the Soft Robotics Toolkit, an open resource for building soft robotics created by Harvard University and Trinity College Dublin, for building a fiber-reinforced actuator using a cardboard mold. A two part mold was constructed using cardboard pieces and then reinforced by hot glue to prevent leakage. EcoFlex, a silicon casting material by SmoothFlex, was then prepared according to specifications and poured into the mold. A piece of paper was placed in between the silicon on the top layer to act as a stiffener. This would constrain the actuator to bend in a specific manner rather when it is inflated. 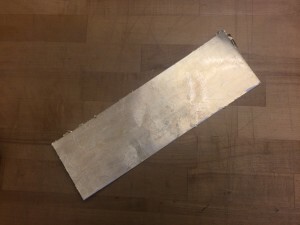 After curing, the silicon pieces were pulled out and adhered to each other with additional silicon. Tubing was then inserted inside the actuator to the open chamber, which is then attached to an empty plastic bottle. 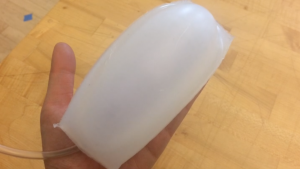 The empty plastic bottle acted as a impromptu pump to inflate and deflate the silicon actuator. 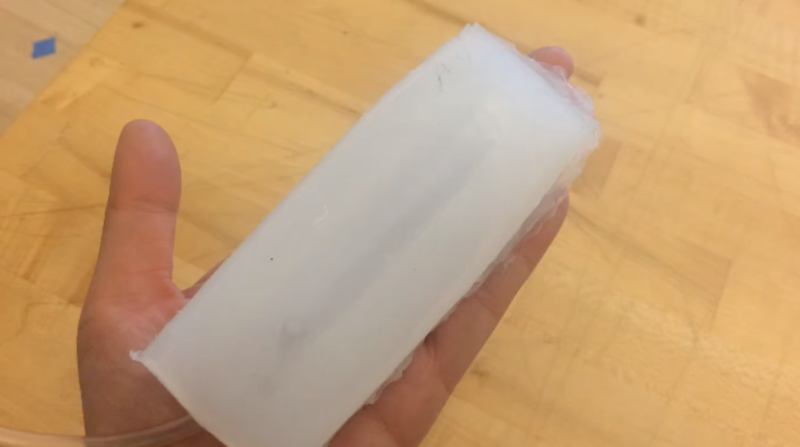 By designing this silicon piece in a cylindrical shape with sections to inflate in succession, the actuator would be able to push dirt through a tube. This action would mimic swallowing, with the dirt being deposited in a “stomach”, or a storage area to be held until the walk is over and the collected dirt can be obtained for analysis. 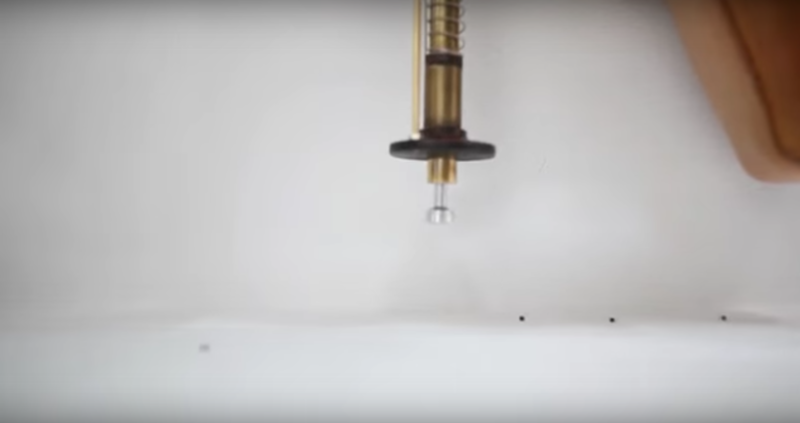 In considering how the cylindrical actuator will be designed, the work of F.J. Chen et al. 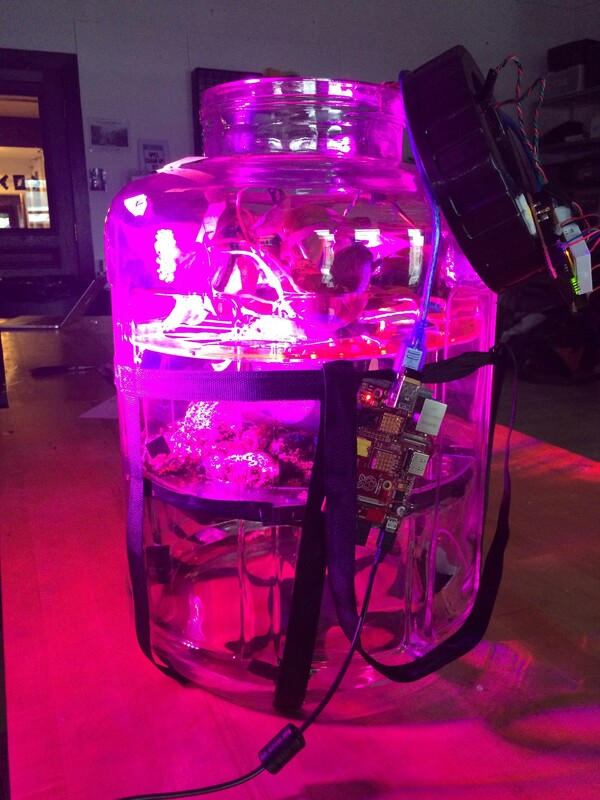 for their work, “Soft Actuator Mimicking Human Esophageal Peristalsis for a Swallowing Robot” was referenced. 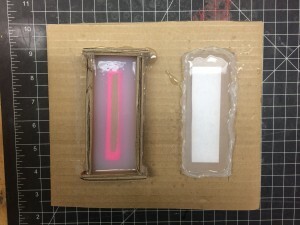 This research developed a soft actuator that replicated a human esophagus to swallow by building a silicon body with horizontal chambers that would inflate in succession to mimic the muscles utilized in a human model. 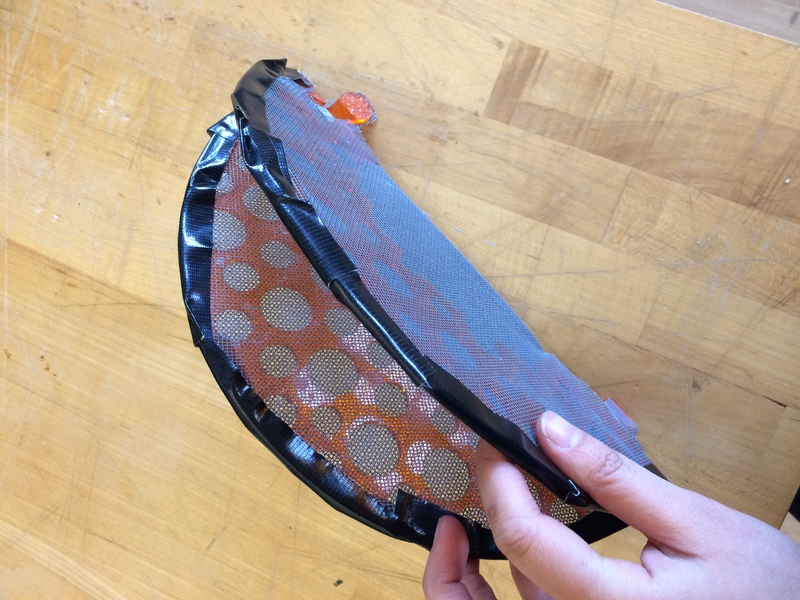 Although this design yields a model that is larger and more complex than what is needed for the soil sample shoe, it provides a basis for the possible functionality of implementing a soft actuator in the prototype. In considering the final form of the overall shoe, designs from fashion footwear are referenced as examples to convey the concept and house the collection method in the shoe. 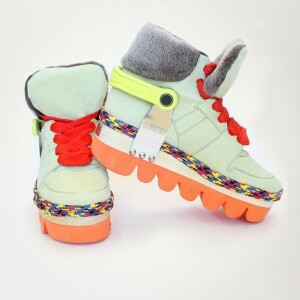 DEGEN, a fashion company based in Brooklyn, New York created a line of outdoor inspired footwear in 2014 that incorporated elements of hiking boots in an unexpected manner. The result is a shoe that has a platform heels, with flashes of bright color at the heel, trim around the sole, and in the laces. The use of a fur trim and nylon cord gives the shoe an “outdoor” aesthetic, while the choice of color and chunky design of the treads read as more playful. The overall form sends a series of mixed messages due to this combination as a fashionable interpretation of a hiking shoe. The playful manner in which DEGEN approached designing the shoe results in an interesting object that can be utilized in considering the final form for the soil sampling shoe. The “Jagger Platform Oxford” by design label, Jefferey Campbell presents another approach to footwear design that can be co-opted in the soil sample shoe. In this design, an oxford shoe has been extended at the outsole with a section created out of clear acrylic which creates a storage space for sequins. This seems to be a more humane version of the platform shoes of the 1970’s popular at discos in which clear heels could be filled with gold fish. Parts of the heel for these platform shoes would be removable to place, feed, or even replace the fish as a decorative item within the shoe 🙁 . By designing a portion of the soil sampling shoe to be clear and transparent, it would allow for the process for collecting the soil sample to be apparent, yet housed within the shoe. In following the designs for the 1970’s clear heeled shoes, parts of the heel could also be designed to be removable to retrieve the soil sample at the end of a walk. 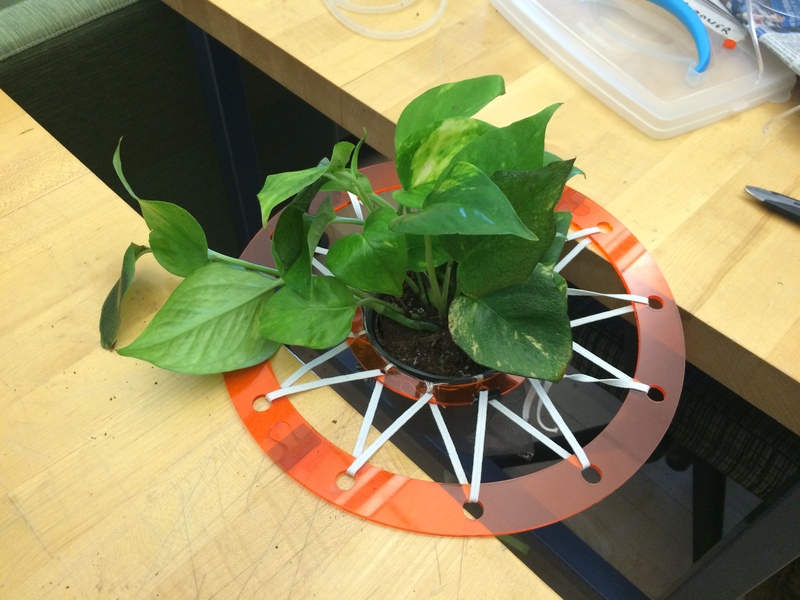 Some bend sensors made using Kobakant’s tutorials that will go on near the base of the plant. Changes in resistance will be recorded as the plant bends throughout the day. The metrics I decided to record for the plant included UV input and movement. Luckily I had a sewable UV sensor and accelerometer from Adafruit in my collection of things. 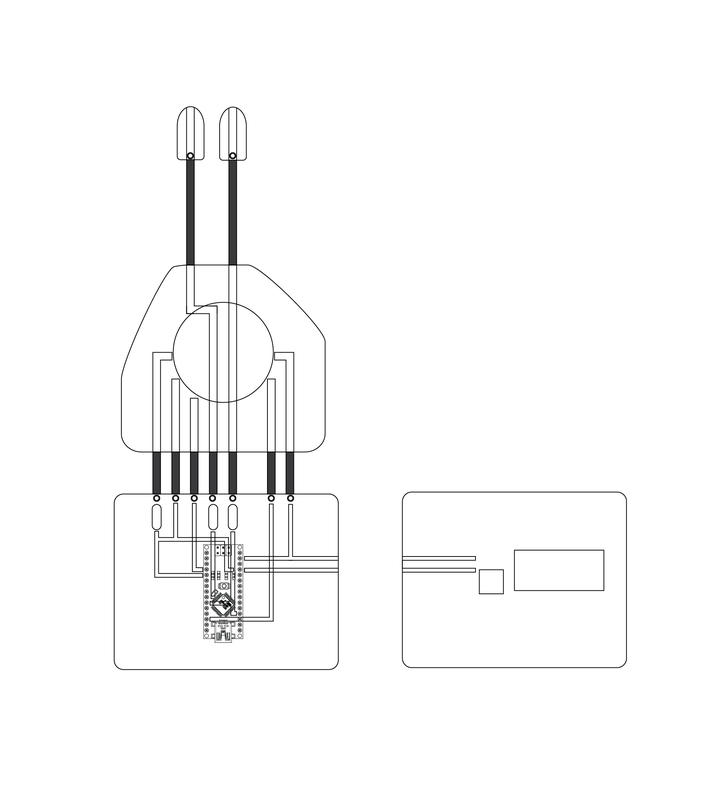 Although the bend sensors are great because they are easy to build and customize, it is helpful to have some more complex sensors. To make it easier to assemble the circuit for the plant while I was out in the field, I made these little mounts for the sensors so it would be easier to clip/sew/staple the components together. I tested different versions of the bend sensor, including a knitted one that didn’t work so well.. 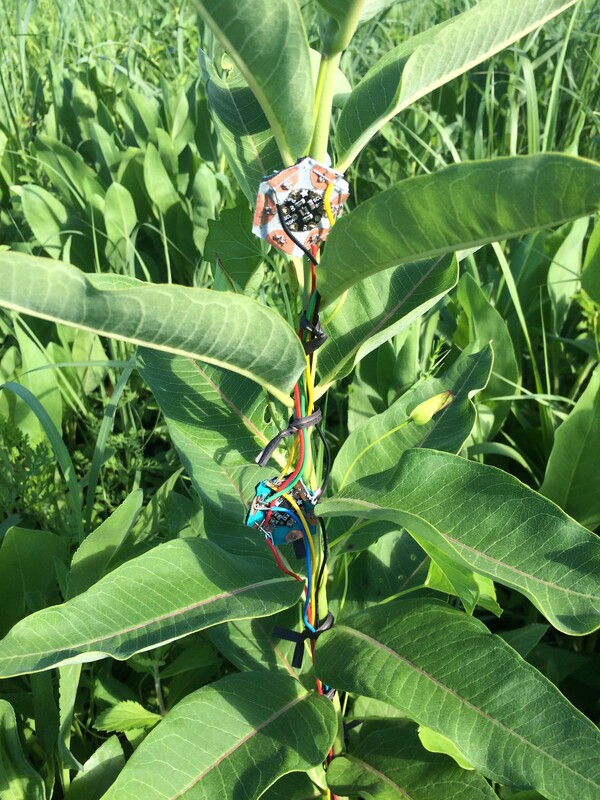 Here are the components strapped on to the milkweed using twist ties (thanks, Walmart) and connections made via staples and wires. There is a Mayfly data logger at the base in a little plastic bag that reads the data input every few seconds or so and stores it in a handy memory card in a .csv file. The milkweed was selected because of its sturdy nature and that it is an important food source for monarch butterflies and other insects, which might give it reason to want to observe various aspects of its movement throughout a time period. 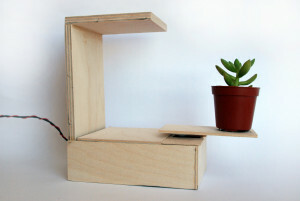 It was interesting to build the circuit onto the plant while standing out in the field – the portable desk did come into use to check the continuity of my circuitry and as a prepping platform. Unfortunately something happened with the connections of the datalogger and stopped capturing data about 1 hour into the installation and this error was not caught until later. 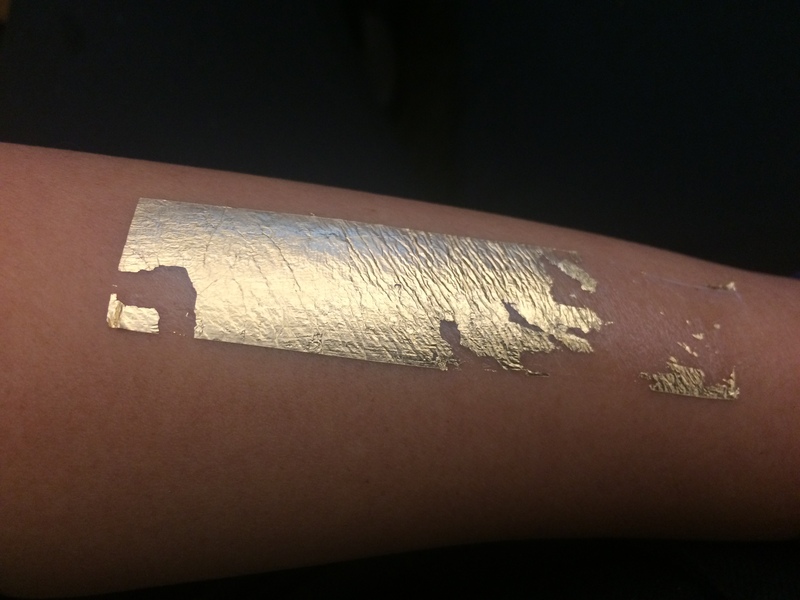 However this project has potential to continue as a way to hone a process down and work with botanists/ecologists/biologists to collect data that may serve their research and as a design project to speculate how non-humans can wear technological devices. One of my classes this semester is working on creating speculative habitat systems for plant life on Mars. 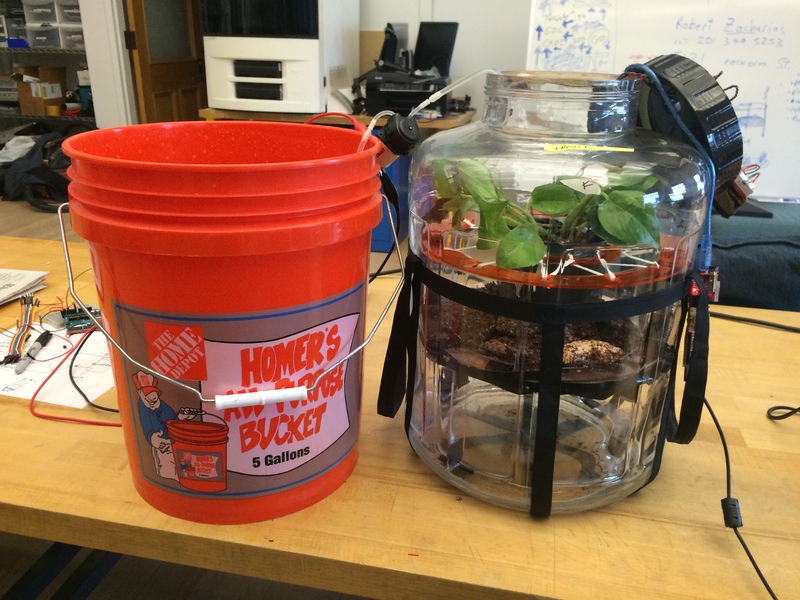 Our recent project was to create a closed loop system. My team decided to work on a “Vertical Plant Parfait” in which three different biomes can live symbiotically in a glass container. On the top we have a plant/photosynthesizing layer, the middle is fungi/decomposing layer, and the bottom is the algae/water layer. We have sensors to detect health of each layer, and a pump runs through the system to provide nutrient/water to the plant and fungi layer. A longer writeup can be seen here. Plant hammock — suspends our plant while allow organic matter(dead leaves) to pass onto decomposing layer. External LED light on our setup. Sensors are run on a Raspberry Pi. How did we get our shelving through the jar? We made some “hinged” laser cut pieces. 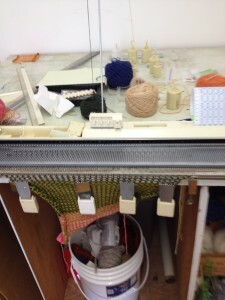 This piece was for our fungus layer and has window screen material layered on the top and bottom. Algae was pumped in at the end. 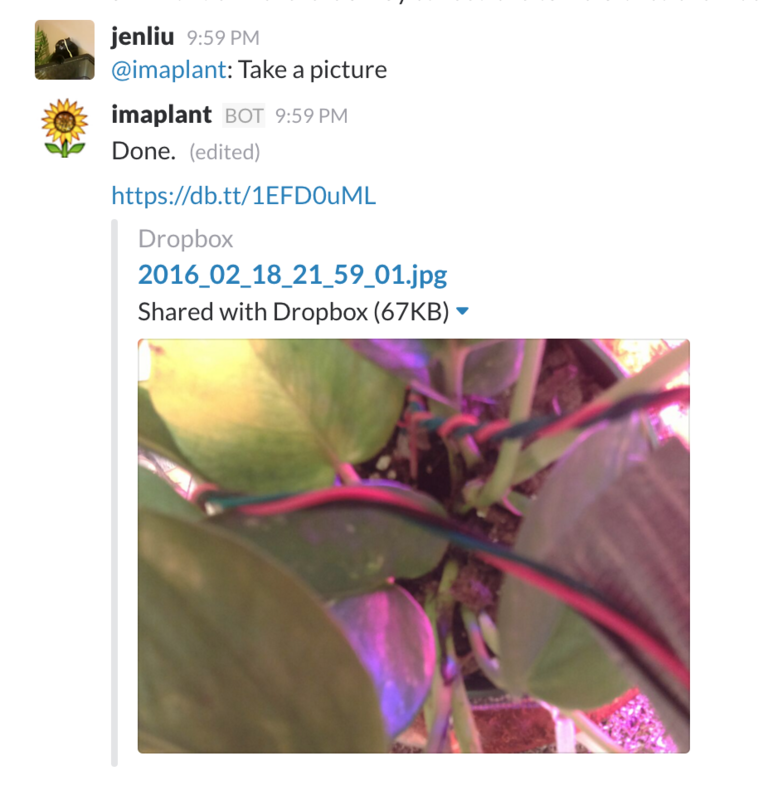 Team Member George made a cool Slackbot for our plant! You can ask for a picture! 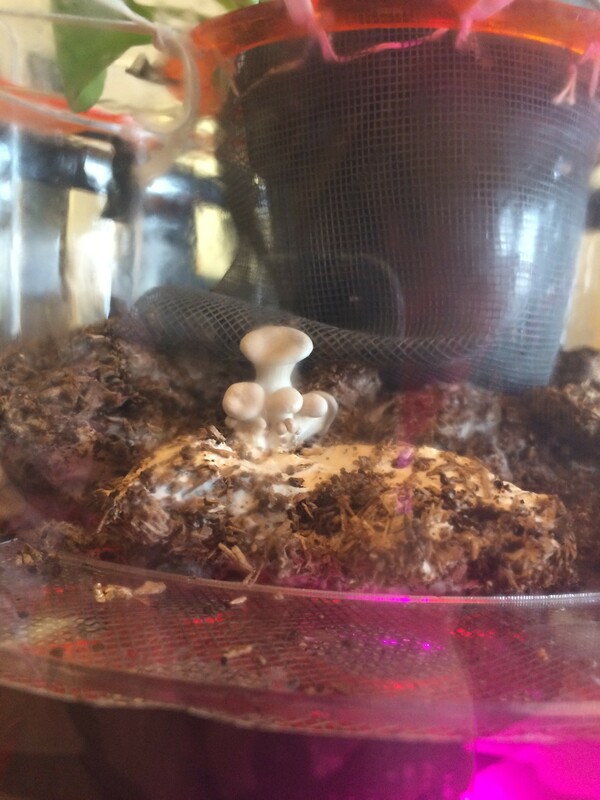 Our oyster mushrooms are starting to come in and it’s excitingggg!!!! This was a collaborative prototype project with my classmate Zach. 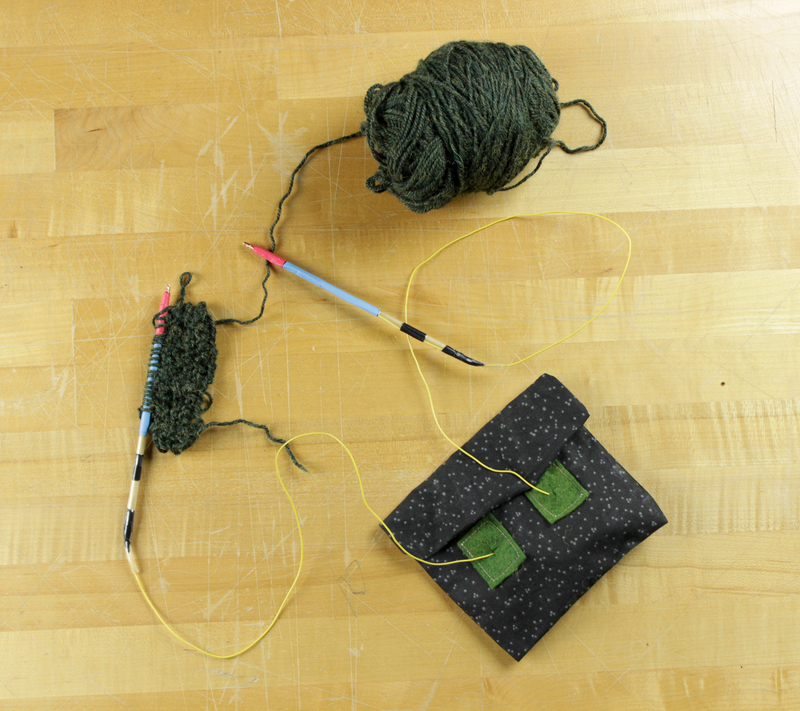 It’s a pair of knitting needles that advance a stitch pattern when you tap the needle points together. The needles have conductive points (made with copper tape) and are connected to wires that lead to this lil pouch. 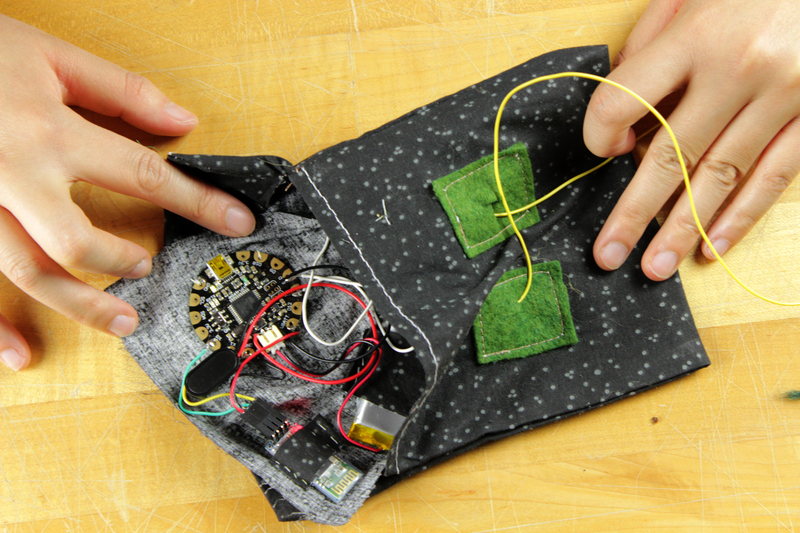 The pouch contains an Adafruit Flora microcontroller, battery, and Bluetooth module which is what is sending information to the computer. The computer program was written in Processing and used a serial connection via the Bluetooth module in the little bag. Here’s some documentation of a recent demo. The inflation of the building is based on an API that is crawling the web for data related to factors that some economists have speculated as factors that we are in a tech bubble. This includes the stock index of some of the unicorn companies in Silicon valley. Unicorn companies are startups that is valued over $1 billion. The fan is controlled by an Arduino microcontroller via Firmata using Processing. The API was made using Kimono Labs, which was surprisingly easy to use! 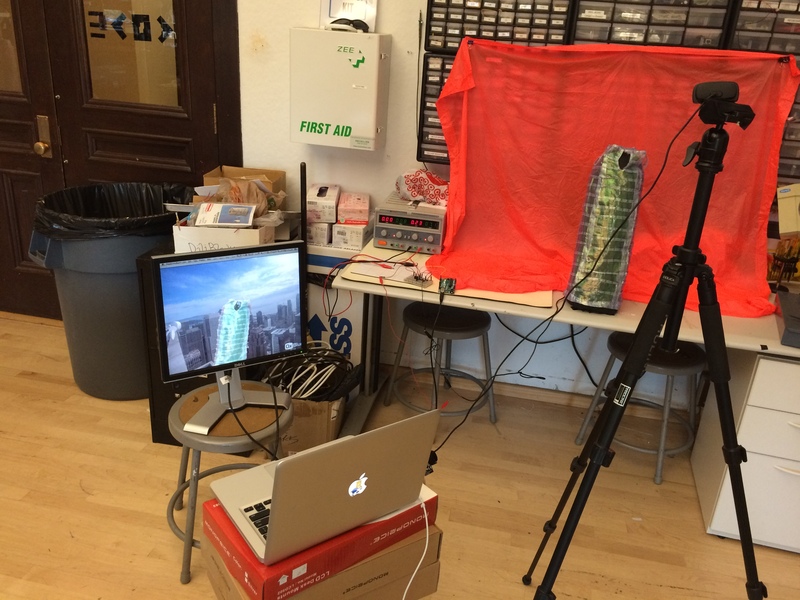 The inflatable building is being recorded live via webcam and fed through another program in Processing that is chromakeying out the orange background (a rain poncho I had on hand) on top of an image from the livefeed that Salesforce has of their building built in San Francisco. So yeah basically you can watch the building grow before your eyes! See this post if you want to see how the building was made! Still very much a work in progress, but the system works to some degree! I’m really interested in the staging and and live capture installation. It’s kind of like a puppet show, where you understand the clashes in reality (like when a puppet represents a human character) but you choose to believe in it to follow the narrative. Here is a gif of the building rising… not advised viewing for the faint of heart. 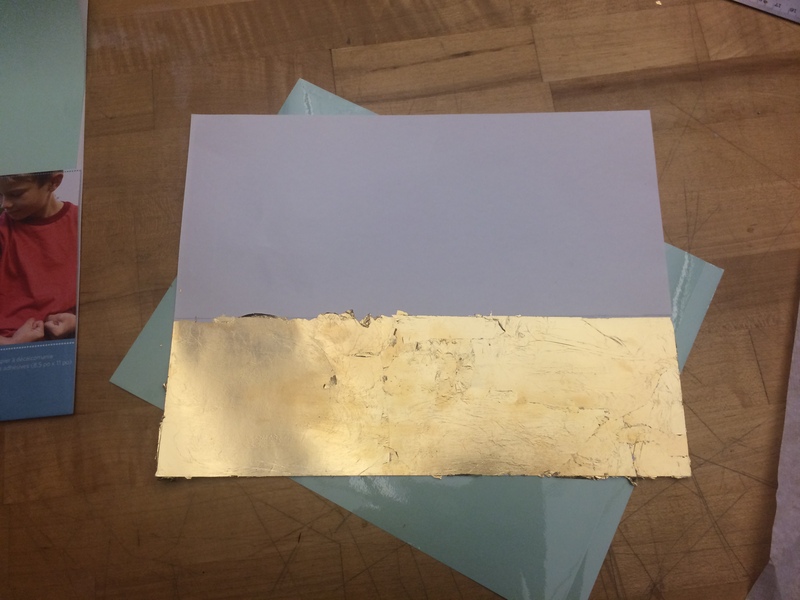 This is a piece I made for one of my classes. The arm on the device will move in or out if it hears rain so that plant can be watered. 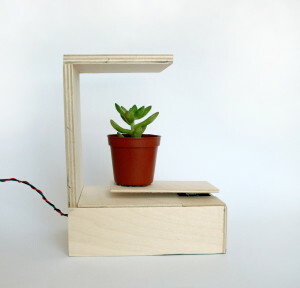 PlantArm from Jen Liu on Vimeo. 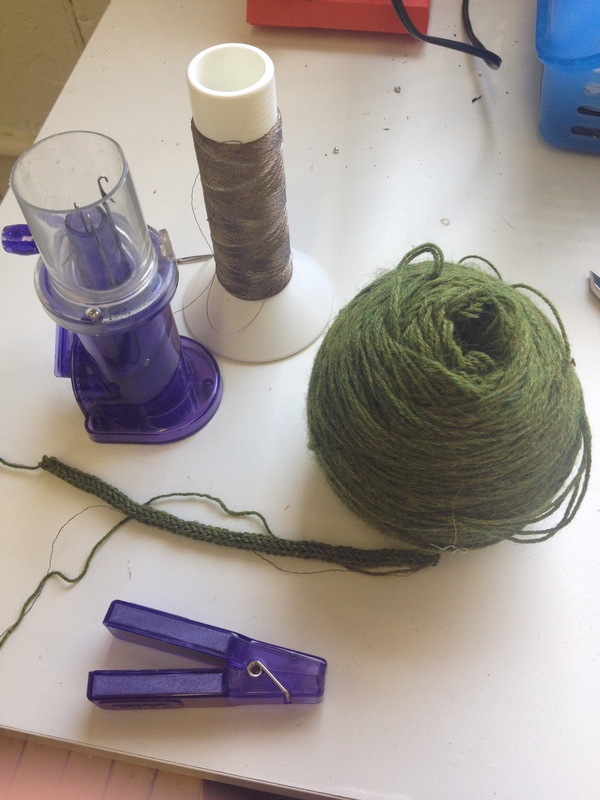 Noise Sweater: The making of! 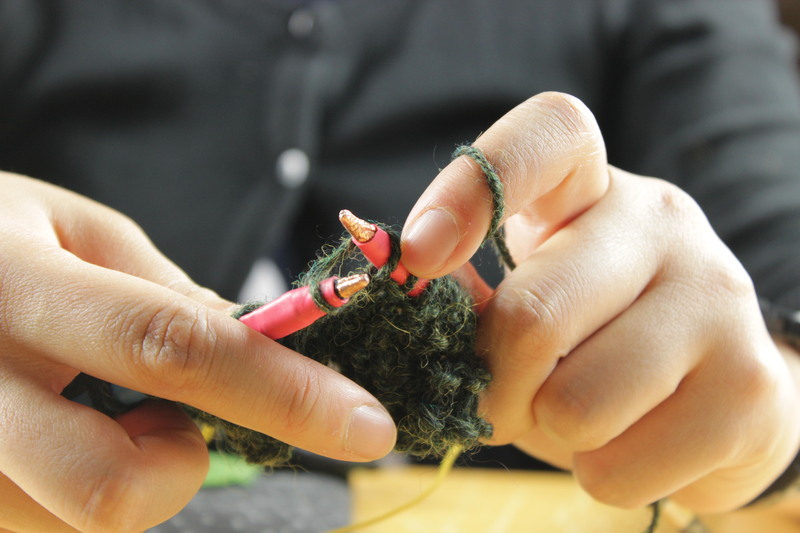 Knitting a cord with yarn and conductive thread on the Embellish – Knit. 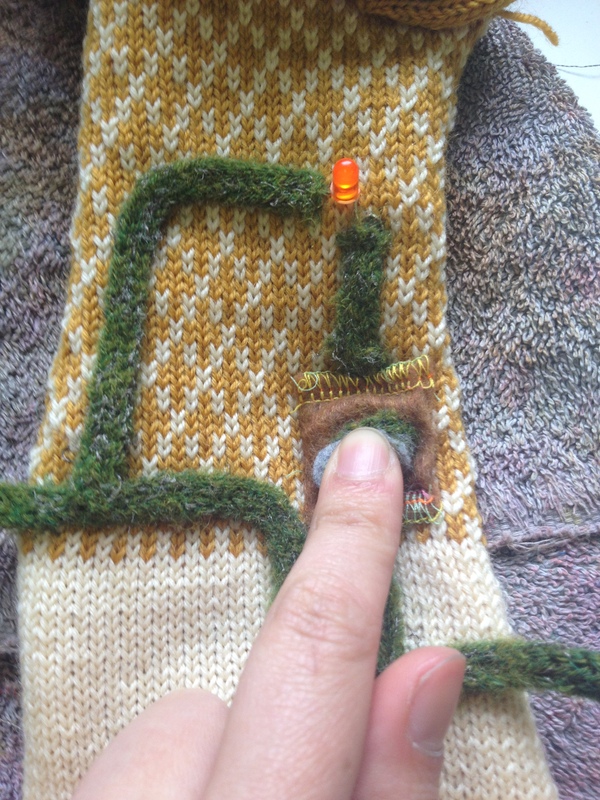 this was then needle felted onto a knitted swatch to light up a lil LED! When needle felting – it is best to use 100% animal fiber. 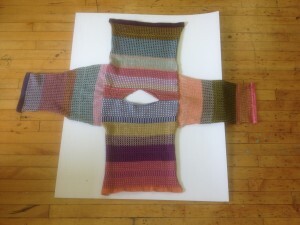 In the above example and for the project, I used an alpaca/lamb wool blend. Knitting on the machine! 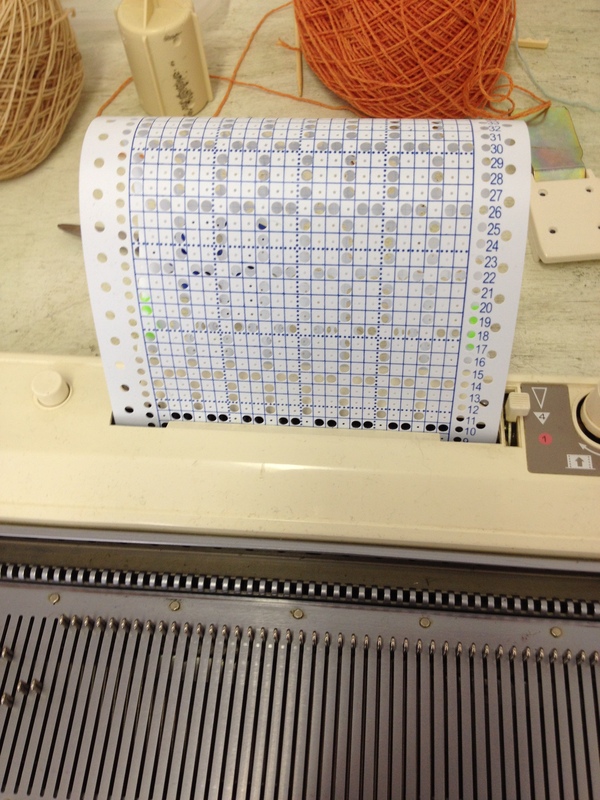 This model uses a punch card reader. Each piece is knitted on the machine and then assembled to create the sweater. Here it is right before all the side seams were completed. Here it is after components are sewn on + trouble shooting! 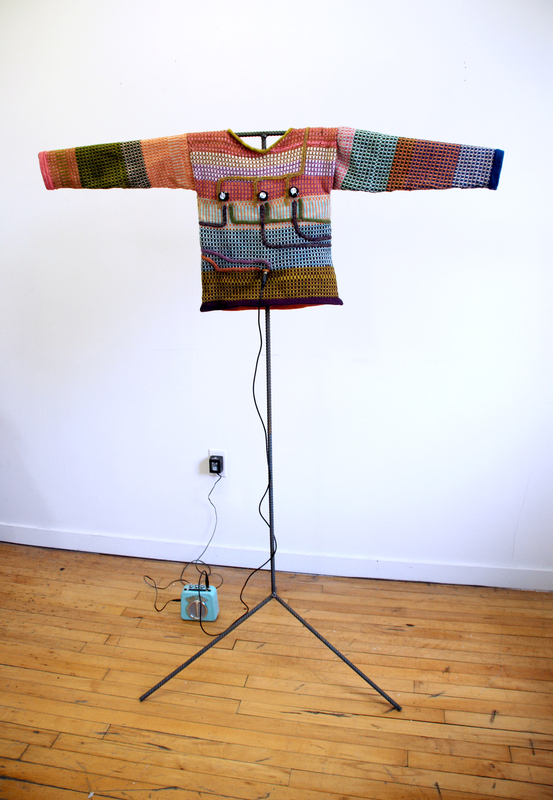 Posted on December 15, 2014 October 30, 2015 Categories Physical Computing, TextilesLeave a comment on Noise Sweater: The making of!